During the Middle Ages there was a constant struggle in the West between the two elements of the temporal power--the central, or national, and the local, or that of the great vassals. Gradually the local governments all merged in large aggregates, in each of which a single national government gathered to itself all military, civil, and judicial functions. This movement was already in progress before the end of the thirteenth century. By the end of the fifteenth the struggle was substantially decided, though it did not come completely to an end till the latter part of the seventeenth century. In France, as in most countries, the agent in this organizing and nationalizing movement was the crown. Almost every French monarch did something toward enforcing recognition of the royal authority in all parts of that country which by geographical conditions, as well as by its history, was fitted for political unity. But, either because they did not see their way to undertaking the direct government of so large an area, or because they were themselves under the dominion of feudal ideas, they did not always avail themselves of their frequent opportunities for extinguishing the local governments of the fiefs which fell into their hands. The Valois kings granted many of them as appanages to their younger sons, and so created a new set of great vassals, who revived the struggle for feudal independence. The most dangerous of these, the Duke of Burgundy, openly aided the English invaders. This prince, besides his French fiefs, possessed the yet more important territories now known as Belgium and the Netherlands. Charles VII., the father of Louis XI., having expelled the English, established a permanent force of nine thousand cavalry--the first standing army in modern times. During the life of his father, Louis was not a dutiful subject. His masterful spirit could brook no superior. He even conspired with the rebel vassals. But as king (1461-1483) he pursued the policy of his greatest predecessors with undaunted courage, patient perseverance, and political genius of the highest order. At first he was too much in a hurry. He tried to clip the wings of all his vassals at once. He irritated the industrial classes by severe taxation. He drove into exile or rebellion his father's ablest generals and councillors. This brought upon him the so-called "League of Public Welfare," headed by Charles the Bold, heir of Burgundy, which aimed at a virtual dismemberment of France. Persevering as Louis was, he had none of the weak obstinacy which cannot distinguish between means and ends. Finding himself overmatched, though he had cut his way through the hosts of rebels at Montlhery, he conceded to them everything they demanded. By the treaty of Conflans (1465) he might seem to have flung up the game in despair, and to have signed the ruin of France. But his high Court of Justice (Parlement), by refusing to register the treaty, gave him an excuse for evading its performance, and by negotiating with the princes separately he broke up their coalition. The peaceful and industrious classes stood by him, and he studiously cared for their interests; mixing familiarly with the citizens of Paris, dining at their houses, standing godfather to their children, putting aside all state and ceremony, and even dressing in humble attire. The precautions of his residence at Plessis belong only to the last months of his life, when he was old and paralytic. Never ashamed to own a mistake and to retrace false steps, he won back the most valuable of his father's servants, whom he had at first driven away. His designs against feudalism were not for a moment suspended. But instead of attacking all his vassals at once he took them in detail; while one was being crushed, others were humored till their turn came. Louis XI. and Olivier Le Dain. As a young man he had shown warlike tastes and brilliant personal valor; but as king he always preferred negotiation and policy. It was a too daring confidence in his mastery of these weapons which led him to risk his famous visit to Charles the Bold, at Peronne (1468), so vividly painted by Scott in "Quentin Durward," who, however, omits to mention the safe-conduct which Charles basely violated. At such critical moments Louis's nerve became steadiest and his intellect most acute. The concessions extorted from him at Peronne seemed to undo the work of years; but when once he was free he found means to remedy all the mischief that had been done. "Never," says his Minister Comines, "was there a man so sagacious in adversity; when he drew back it was to make a longer spring." In another war with Burgundy, Edward IV., of England, landed with a large army (1475). To warlike nobles it seemed very base that Louis bought off the invaders instead of rushing upon another Crecy or Agincourt; but he thoroughly despised such criticism. He had an army, and a good one; but if a round sum of money would effect his purpose more cheaply, surely, and speedily, why should he expose his subjects to the horrors and losses of war? Two years later Charles fell at Nancy, fighting against the Swiss, who were in the pay of Louis. It was the death-blow of feudalism. Louis promptly seized the duchy of Burgundy and some other territories of the deceased duke. Altogether, during his reign, he brought eleven provinces under the direct government of the crown--Brittany being the only great fief which at his death remained independent. He had thus assured the unity of France and her preponderance in Europe. Hardly less important services to his country were his establishment of order and good administration, his financial and judicial reforms, his encouragement of industry and commerce. "He effected," says Lavallee, "attempted, or projected, all the innovations of modern France." Diplomacy, the modern makeshift for the international office of the mediaeval papacy, dates from him. Historians have dwelt on his cruelty, perfidy, and superstition. Turbulent nobles, like St. Pol and Armagnac, were brought to the block; treacherous ministers, like Cardinal La Balue, were kept for years in iron cages; vulgar criminals swung from gibbets on every highroad. But this severity toward ruffians of high and low degree, who had preyed on the country for the best part of the century, wrought peace and prosperity for the law-abiding and industrious. In the decay of feudal manners and Catholic discipline, the sentiment of honor had almost vanished from public life. But, judged relatively to his times, Louis is not to be branded as perfidious. He did not scruple to break treaties contrary to the interests of his country, which had been extorted from him by force; but he was more straightforward than his principal contemporaries. Twice, when he could have got rid of Charles the Bold by acts of treachery, which in those days no one would have blamed, he chose the honorable course. To reproach a man of the fifteenth century with superstition, because he thought there might be some efficacy in images and relics, is an abuse of language. If he clung to life it was because he felt that so much of his projected work remained unfinished. He met death with remarkable fortitude, his thoughts and efforts being to the last moment occupied with the affairs, not of his soul, but of his country. 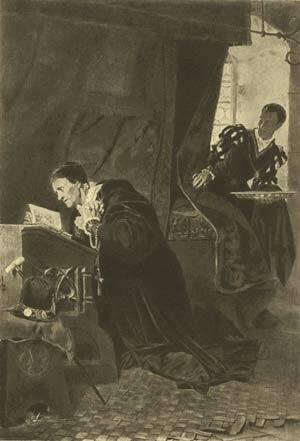 His minister and intimate friend, Comines, has left a faithful and judicious account of his life. Two great poets have dealt unfairly with him: Scott could not forgive the foe of feudalism; Hugo was blinded by democratic prejudices.